Zierick Manufacturing Corp., Mount Kisco, NY, a stamper of electronic components and provider of automation equipment such as insertion machines related to electronics-parts production, received the 2009 Higgins-Caditz Design Award for developing a metal-stamping-based system for connecting wires to surface-mount printed circuit boards (PCBs). Previous methods of attaching wires to PCBs were complex, labor-intensive and costly, and required an excessive amount of bulky parts. Zierick Manufacturing’s goals in developing a new system included simplifying the process, miniaturizing parts and maintaining reliability while minimizing costs. To reach those goals, the company developed an insulation-piercing crimp terminal. Zierick MfgThe terminal consists of a unique flat base for solder adhesion when surface mounting, with two insulation-piercing contact spikes protruding from the base. The terminal has two sidewalls perpendicular to the base as well as two deep grooves in the transition area between the crimp ears and the base. These ensure that crimping a wire into the terminal and forming the crimp ears around the wire do not subject the solder joint on the circuit board to stress cracking. Inside the terminal, between the two contact spikes, a flat area facilitates vacuum pickup of the terminal by surface-mount placement systems. The terminal is placed and soldered onto the PCB with all of the other components, all using the same process and the same automated system. Upon attachment of the terminal to the PCB, the wire can be crimped at any time, on the assembly line or in the field. Importantly, no wire stripping is required. A terminating tool wraps the crimp ears around the wire, ensuring a good electrical connection by forcing the piercing spikes into the wire strands. This insulation-piercing process requires significantly less force to terminate a wire than conventional crimping, minimizing shock load on the PCB assembly. The crimp terminal is produced in a high-speed 14-station progressive die. Zierick has sold more than 9 million terminals with zero customer returns and zero complaints. Company officials estimate that this wire-attachment method can save users as much as 90 percent in cost and more than 80 percent in labor time when compared to alternate methods. The Higgins-Caditz Design Award, created by the Worcester Pressed Steel Co., Worcester, MA, and sponsored by the Quarterly Club, recognizes a manufacturing company for outstanding achievement in developing an innovative product design. Zierick Manufacturing will receive a $1500 cash prize. Radar Industries, Warren, MI, received the 2009 Ulbrich Award for Competitive Excellence in Product Development for developing a stamped shock clevis that attaches to the lower control arm and supports the shock tube in a vehicle. The award-winning part, originally a casting, was redesigned by Radar Industries as a progressive-die stamping. Two versions of the clevis were designed for the customer—a weld-on application and a pinch-bolt application. Both patent-pending designs are being tooled for production, with a progressive two-out die producing the weld-on clevis in a 2200-ton Schuler press. Radar IndustriesFactoring in all of the manufacturing and machining costs of the cast part, Radar replaced the casting with a stamping for less than one-third of the original price. The changeover also brought several functional improvements as well as less weight without loss of performance. Unlike the casting, the stamped part requires no secondary machining. 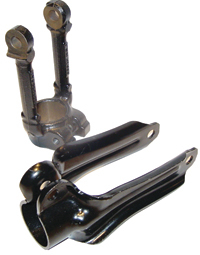 On the pinch-bolt design, the ears of the part are formed into the clevis, allowing the operator to simply attach the clevis to the shock assembly with a nut and bolt. The customer is satisfied because the new part designs allow simple assembly with no need for specialized machines to insert the shock assembly. Radar Industries expects to supply more than 500,000 vehicles with its stamped metal shock clevis, with two parts per vehicle. The Ulbrich Award for Competitive Excellence in Product Development, sponsored by Ulbrich Stainless Steels and Special Metals, Inc., North Haven, CT, acknowledges a manufacturing company that demonstrates outstanding innovation in developing and manufacturing a product that best uses metal in place of a nonmetal competitive material. Radar Industries will receive a $1500 cash prize. 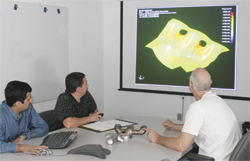 ART Technologies, Hamilton, OH, received the 2009 Zierick Manufacturing Corporation Productivity Award for automating four machines across two operations to improve productivity and increase capacity. ART Technologies supplies stamped race thrust bearings used in the automotive, heavy truck and RV industries. Art TechThe emergence of Asian bearing manufacturing spawned a number of low-cost competitors, so ART Technologies needed to decrease costs and improve pricing to compete. 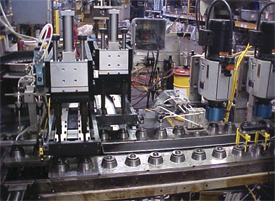 As a result, the company developed a process to automate the loading of two assembly machines and two presses, which brought a 33 percent capacity increase for bearing assembly, a 57 percent capacity increase for small race coining, a 24 percent decrease in annual labor cost for these products, and a 43 percent increase in sales of the products. In addition, the reduced labor cost and increased capacity has enabled customers to bring bearings previously sourced to Asia back to ART Technologies in the United States. The project ultimately resulted in a two-person staffing reduction per machine and a 25 to 140 percent increase in hourly production. The company also rearranged coining presses into a workcell, leading to a partial-person manning reduction and improved manning stability. The reduction in manpower resulted from attrition and retraining. The remaining manpower was incentivized by increased pay and job responsibility. For example, when each press was automated, one person on each shift was retrained and reassigned. The setup person assumed responsibility for attending the newly automated machines, receiving a pay increase for the assumption of increased responsibilities in exchange for project buy-in. The Zierick Manufacturing Corporation Productivity Award, sponsored by Zierick Manufacturing Corp., Mount Kisco, NY, recognizes outstanding achievement by a PMA manufacturing member in the development and implementation of programs, processes and use of assets that lead to significant improvements in productivity. ART Technologies will receive a $1500 cash prize. Pridgeon & Clay, Inc., Grand Rapids, MI, received the 2009 Link Systems Process Control Award for employing an inline measurement gauge to inspect parts for flatness around the mounting holes on a steering support bracket. Pridgeon & Clay supplies stamped and fineblanked components to the automotive industry. The flatness around the mounting holes on a steering support bracket manufactured at Pridgeon & Clay requires a ±0.1-mm tolerance. 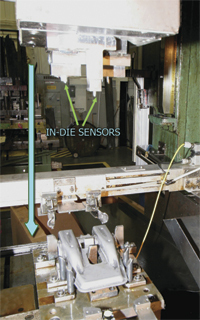 To ensure adherence to that tolerance, the company designed and built an inline flatness-measurement station within its transfer-stamping process that uses seven Solotron digital probes per mounting hole—three probes establish the flatness plane and four probes check four points around the mounting holes. Pridgeon processThe inspection gauge mounts at the end of the transfer die, with each part inspected for flatness at a speed of 22 strokes/min. An industrial PC running Windows XP, with a standalone LabView-built program, establishes communications with the digital probes, and reads the probes and digital input/output. LabView computes the mathematical equation, comparing the points around the holes to the established plane and establishes a flatness measurement. LabView also determines if flatness meets the required tolerance. If it detects a part out of spec, it signals the part-out chute to divert the bad part to a reject container. Should the gauge detect more than five bad parts in sequence, the process stops and personnel inspect the die and adjust it if necessary to bring flatness back within tolerance. Measurements from each part store in the company’s database for future reference. Prior to incorporating an inspection station in the stamping operation, the company inspected every part for flatness in an offline electronic gauging machine, which required an operator to manually load and unload the fixture. Operators placed any out-of-spec parts into a reject container. By designing and building the inline measurement gauge, Pridgeon & Clay not only reduced costs by more than 50 percent, but also eliminated the possibility of running several thousand parts with out-of-tolerance flatness before being checked on the offline gauge. The Link Systems Process Control Award, sponsored by Link Systems, Nashville, TN, promotes the application of electronic-analog closed-loop process controls in the metalforming process by recognizing innovative electronic solutions implemented by a North American manufacturing company, which have resulted in significant quality, cost reduction and/or productivity improvements. Pridgeon & Clay will receive a $1500 cash prize. 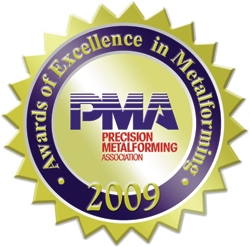 Pridgeon & Clay, Inc., Grand Rapids, MI, received the 2009 Parkview Metal Products Excellence in Quality Award as part of the Precision Metalforming Association’s (PMA’s) Awards of Excellence in Metalforming. Pridgeon & Clay attributes its success to many factors, including the implementation and registration of a strong quality system and the many facets of that process. In fact, the company’s commitment to quality has delivered impressive measurable results. For example, in 2007, Pridgeon & Clay, citing data from its customer scorecard that tracks its top 20 customer metrics, had six customers with a parts-per-million (ppm) score in the red and four in the yellow. In 2008, only two customers had a ppm in the red and one in the yellow. Also in 2007, ppm totaled 197, while through September 2008 that number has been reduced to 30. PPAP timeliness also improved, from 70 percent in 2007 to 100 percent in 2008, as did the number of customer concerns. The company identified several contributors to these improvements, including ongoing review of data from internal and external inspection processes. Closer monitoring has allowed Pridgeon & Clay to react more quickly to problems as it no longer has to wait for customer calls or for end-of-the-month performance reviews. Also, the firm has improved its root-cause analysis and instituted a new approval process for closure of external concerns. Since this implementation, the company has experienced no repeat incidents at its customers for closed corrective actions. Given such progress, Pridgeon & Clay has been able to focus on internal measures and proactive items, with the commitment of its executive management. The executive staff closely monitors customer satisfaction and continuous-improvement efforts, and has developed a corporate scoreboard that offers a bird’s-eye view of performance, with supporting scoreboards for each production and support department. In addition, all levels of management participate in external and internal quality audits. Data collection and analysis, a staple at Pridgeon & Clay, has been re-assessed to ensure that the most helpful information is gleaned and vetted. To that end, the company has invested in equipment such as a robotic part checker that, when fully implemented, could eliminate individual part-attribute gauges and collect more dynamic information for analysis and die adjustments. Quality has become part and parcel of daily employee life at Pridgeon & Clay. The company’s employee suggestion program realized a cost savings of more than $202,000 during the first nine months of 2008. Enabling all of this is the company’s commitment to employee training and education. All employees attend Back to Basics classes that cover business, quality, press, steel and process-planning fundamentals. Beyond that, the company offers numerous elective classes in its onsite learning center, and press operators undergo an extensive training program that includes 20 classes as well as on-the-floor demonstrations. Other employee-education efforts include tuition reimbursement and a recently held onsite Education Fair where representatives from local colleges explained their offerings. The Parkview Metal Products Excellence in Quality Award, sponsored by Parkview Metal Products, Lake Zurich, IL, recognizes outstanding achievement by a PMA manufacturing member in the development and implementation of a company-wide quality system that effectively uses continuous improvement. Pridgeon & Clay will receive a $1500 cash prize. Trans-Matic Manufacturing Co., Holland, MI, received the 2009 Pitcher Insurance Agency Safety Award. Trans-Matic produces deep-drawn metal stampings for the automotive, hardware, plumbing, marine and appliance industries and employs approximately 245 workers in two U.S. production centers, and one production center in China. The company applied simple, achievable, practical ideas to increase awareness, prevent injuries and save money. In 2004, workplace injuries were on the rise at Trans-Matic. The company’s total OSHA-recordable incident rate (TCIR) was 51 percent higher than the average for the metal-stamping industry, and the incident rate for cases with days a, restrictions and transfer (DART) was 38 percent higher than the industry average. “It was a troubling period for us, regardless of growth or any other success we were having,” says P.J. Thompson, president and COO of Trans-Matic. In response, Thompson held company-wide meetings and began laying out plans and expectations for a strong safety culture. In early 2005, Joe Hartings joined Trans-Matic as the new safety manager, and began making fundamental changes to the safety program, beginning with emphasizing the importance of early reporting, investigation and corrective action. Trans-maticTrans-Matic had been averaging a 16-day delay in reporting—from the date of the injury, to the date of the report to the workers’ compensation carrier, with near misses not routinely reported nor addressed. To correct this problem, the company changed its entire reporting process to same-day reporting, with an emphasis on reporting near misses with the same urgency as injuries. Incidents were discussed and corrective action addressed daily with production managers and team leaders. These efforts caused a dramatic increase in the number of incident reports, but the number of OSHA-recordable injuries began to drop. Trans-Matic also underwent a process to reintroduce basic safety rules. Employees, team leaders, managers and executives became fully immersed in safety-policy development. The revised policy was presented to all employees in the Safety Policy Handbook. Other communication tools evolved as well. The safety manager attends daily production meetings at least three times a week to discuss safety measures, policy changes and emerging trends. Trans-Matic also produced a 5-Minute Safety Talk document to provide safety-training information to employees, safety bulletins to update the company on any safety issues that arise, and safe work instructions. Training styles expanded from classroom-style lectures with large class sizes, to individualized training in a private office. Equipment operators view training materials, take written tests and receive evaluations on power-equipment operation. 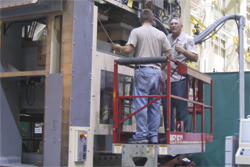 In 2005, Trans-Matic dismantled its large safety committee in favor of smaller work teams assembled for specific projects and issues. In 2008, the firm established a safety steering committee of 12 employees, including an apprentice, toolmakers, team leader, managers, and administrative and executive team members. The safety steering committee is preparing Trans-Matic for the Michigan OSHA MVPP Star Award application and OHSAS 18001 certification. The committee also continues to identify s to increase and improve employee involvement. Trans-Matic’s program has yielded excellent results, as reportable injuries have continued to decline over the last several years and now are 20 percent below industry averages. From 2005 to 2008, Trans-Matic reduced its OSHA-recordable incidence rate by 65 percent and its DART incidence rate by 92 percent. The Pitcher Insurance Agency Safety Award, sponsored by Pitcher Insurance Agency, Chicago, IL, acknowledges either an effective comprehensive safety program or a specific innovative idea in the context of an effective safety program. Trans-Matic Manufacturing will receive a $1500 cash prize. The Minster Machine Company, Minster, OH, and Pridgeon & Clay, Grand Rapids, MI, have been named cowinners of the 2009 A.R. Hedberg Training and Education Award. Minster was honored for its Future Workforce Development Initiative, created in response to the need for a higher-skilled workforce to meet market demands for innovation and technology advances and the need to replace a retiring senior workforce. The initiative targeted two areas of the company: engineering and OEM assembly. MinsterTo pursue and develop engineering talent, Minster directed its efforts toward trainee engineering programs (part-time high school), intern opportunities (early-college summer work terms) and co-op opportunities (advanced-college work terms). 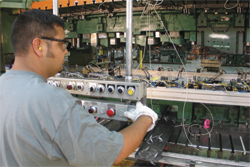 Given Minster’s senior workforce in the OEM assembly area, the company formed an apprentice program to stop the loss of skills and actually increase the overall skills in this area. The program consisted of six major phases: general training, crown cell assembly, bed/ upright cell assembly, clutch cell assembly, slide cell assembly and final cell assembly. The company tracks classroom and hands-on apprentice training, (above) and each apprentice must pass all evaluation tests. New apprentices enter the program yearly and receive continuous training for 30 months, at which time they become fully trained machine-tool builders. Pridgeon trainingThe OEM assembly program has become a pilot for other programs within Minster, including service technician, machine-tool builder, welding, precision machinist, mechatronics, remanufacturing and foundry-molding apprentices. The other cowinner of the award, Pridgeon & Clay, was recognized for developing a standardized training program for all automatic press operators (APOs). The goal of this program was to develop a to formally train press operators (below) given that the company had grown and was unable to keep up with hiring qualified APOs, and that press technology employed by the company had increased in complexity. The program also stemmed from Pridgeon & Clay’s business strategy that included standardizing the the company runs its presses and trains its employees. An APO Certification Development Advisory Team was established, which met with a consultant to brainstorm ideas for program development and identify core competencies for press operators. Pridgeon & Clay also purchased metal-stamping curricula to aid the company’s Subject Matter Experts (SMEs). Using the core competencies, 20 subjects were developed by the SMEs. The team then reviewed each class and provided feedback on content and validity to the SMEs. Groups of five to seven operators are selected to go through the entire APO program together, with training required for press operators, technicians and team leaders in press areas. Each group attends one weekly class with a test in the classroom and a shopfloor application. Classes are offered during employees’ shifts, with classroom and shop-floor training occurring on the clock. With the implementation of this certification process, 100 percent of APOs have completed course requirements. The A.R. Hedberg Training and Education Award recognizes an outstanding achievement by a PMA member company in employee technical education through a comprehensive training program. The award is sponsored by HPL Stampings, Inc., Lake Zurich, IL, in memory of A.R. (Ray) Hedberg, a leader in employee training. The Minster Machine Company and Pridgeon & Clay will each receive a $750 cash prize. Are You a Winner in 2010? Stake your claim by submitting an entry for PMA’s Awards of Excellence in Metalforming. It’s your chance to recognize employees, have your company recognized within your industry, and let your customers—and potential customers—know what you bring to the table. Visit www.pma.org/awards to see details about each award, or contact Christie Carmigiano at 216/901-8800 or ccarmigiano@ pma.org for more information. 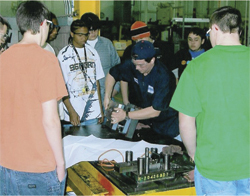 William D. Ford Career-Technical Center, part of ne-Westland Community Schools in Westland, MI, received the 2009 Clips & Clamps Industries Educational Institution Award, recognizing its machine-tool-operation/machine-shop class. As part of the engineering, manufacturing industrial technology career path, the class offers a comprehensive, high-tech approach to machining and manufacturing. production of prototypes for students’ own inventions. These skills, practiced daily, help students market themselves for employability in the metalforming industry. William D. Ford Career-Technical Center students showcased their talents during the Innovative Vehicle Design competition at the SAE Convergence 2008 Transportation Electronics Conference in Detroit. The students designed and fabricated the HydroVolt, a fuel cell/plug-in hybrid vehicle, which featured steer-by-wire, a data-acquisition system, computerized driver-information system and a 200-W fuel cell that recharged the batteries to power the electric motor. It also featured custom T-bucket styling, bringing retro design together with advanced engineering. The HydroVolt team won first place awards in Innovation, Engineering and Fabrication, as well as in the category of Professional’s Pick, where engineers and executives who attended the conference interviewed the students, reviewed the vehicles and voted for their favorite. The relationship between the school and the metalforming industry is thriving due to a strong advisory committee comprised of local businesses that offer students internships, co-op and employment opportunities. The Career-Technical Center has an 80 percent placement rate for students enrolled in the CAM program.